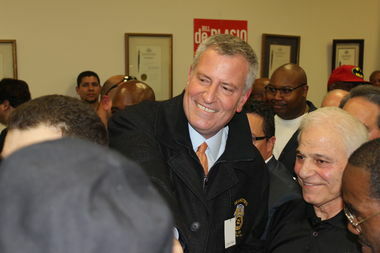 Mayor Bill De Blasio greeted sanitation workers after receiving their endorsement. FINANCIAL DISTRICT — Mayor Bill de Blasio unofficially kicked off his campaign for re-election Monday, receiving an endorsement from the Uniformed Sanitationmen's Association, one of the city's largest unions with 6,500 workers. Speaking before a crowd of 200 workers who started chanting "four more years," the mayor talked about how important union jobs are to the city and how much he respected the work of "New York's Strongest." De Blasio used the election of President-elect Donald Trump as a foil without mentioning his name. "If Washington turns against labor unions..." said de Blasio. "...There's gonna be a problem," said one worker finishing the mayor's sentence. "Thank you, brother," the mayor responded. "There are a lot of people who don't have a union job who should have one right here in this city," the mayor added later. Union president Harry Nespoli praised de Blasio for settling the union's contract. When the mayor came into office none of the city's unions were under contract, now that figure is more than 90 percent. Nespoli said de Blasio "has been a friend to labor, he respects and fights for working families and good jobs, and deserves another four years." De Blasio has held private fundraisers in advance of next year's race, but the endorsement is the first public event of the mayor's re-election. He signaled his intentions to kick off his campaign when high-ranking City Hall aide Phil Walzak returned to de Blasio's campaign as a senior adviser last month. The full field of challengers the mayor will face is unclear at this point. Republicans Michel Faulkner, a Harlem minister and ex-New York Jet launched his mayoral campaign in 2015 and real estate executive Paul Massey launched his campaign in August. Jimmy McMillan, who founded of the Rent is Too Damn High party, also said he will run for mayor again in 2017. Other names mentioned as possible challengers include Comptroller Scott Stringer who has ramped up his public criticisms of the mayor and Republican Councilman Eric Ulrich. Bronx Borough President Ruben Diaz Jr., billionaire businessman John Catsimatidis, Brooklyn Congressman Hakeem Jeffries and real estate developer Don Peebles are some of the others mulling a run. Also throwing uncertainty into the mayor's re-election campaign is the status of multiple federal and state investigations into de Blasio's fundraising practices. The mayor didn't mention any of that Monday, focusing on his theme of reducing income inequality, giving unions credit for the passage of his affordable housing plan and paid sick leave. The mayor also touted his community policing plan and how he believes it will help New York continue to achieve record low crime figures. And then the mayor attacked Trump. "This election has left a lot of confusion, a lot of unanswered questions," said the mayor. "We are going to defend the values of this city. We are going to keep working to make sure that working people are treated right. "We are going to be the city that shows that we have to be striving for more justice for working people, more fairness, more opportunity, not more and more power in the hands of the 1 percent." The sanitation union agreed to a seven-year contract that dates back to 2011 and provides 11 percent in wage increases and savings in health care spending. Sanitation workers said they felt the mayor had looked out for them and weren't worried about some of the other criticisms of de Blasio. "He's done right by us so far. He gave us a decent contract, new equipment. I don't have any problem with him," said Fred Ganzy, 45, a sanitation worker for 15 years. And the mayor's use of Trump as a foil seems to be paying dividends already. "I don't think Donald Trump has the best interests of unions in mind," Ganzy added.